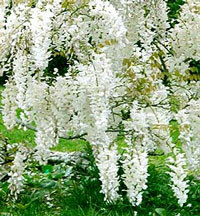 Wisterias [wis-TEER-e-yas] are sturdy woody vines with graceful foliage and spectacular cascading flowers. 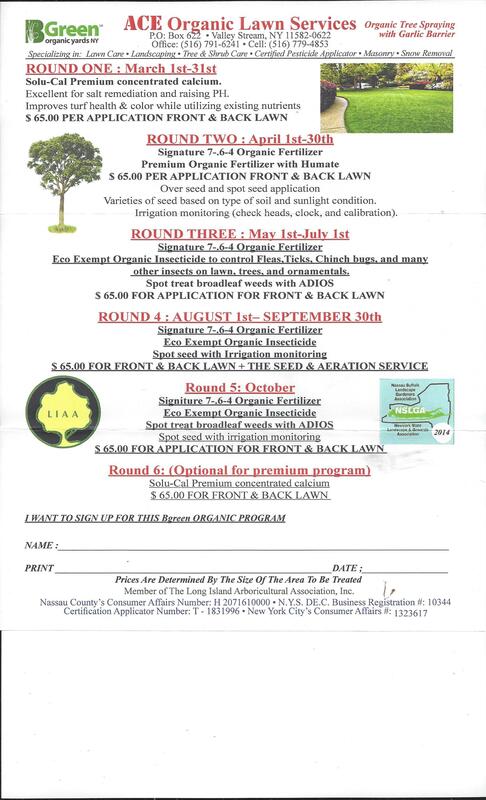 Members of the pea family, they have always been landscape favorites of homeowners. Perennial plants, they bloom for many years. 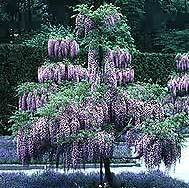 Many persons regard wisteria as the premier ornamental vine. Wisterias are beautiful and easy to grow. While there are several types of wisterias, Japanese Wisteria (Wisteria floribunda) is one of the most popular in northern yards and gardens. 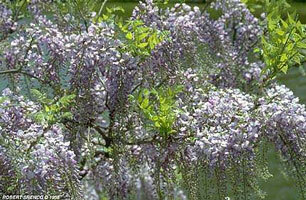 Size: Japanese wisterias climb to 30 feet or more, and spread as far as they're allowed. They spread vigorously, twining from right to left around their support. Foliage: Leaves of Japanese wisteria are made up of 13 to 19 small leaflets that are arranged along thin leaf stems. The leaves are dark green over the season, turning to yellow in autumn before falling at frost. Flowers: Individual Japanese wisteria flowers are like pea flowers. They hang in magnificent clusters up to 36 inches long. Typically they are deep violet. Emerging in late May just before the leaves come out, the tiny flowers open progressively from the base of each cluster to its tip. They bloom over a period of 4 to 5 weeks in the spring, their heavy fragrance permeating the landscape. Some varieties have white, mauve, or pinkish flowers. The flowers give way over the season to long, furry green bean pods that hang on the vines all winter. The pods are not edible. Wisteria Choices Better Varieties: `Issai Perfect' has white blossoms, blooms even on young plants; `Rosea' has rose to pink flowers; `Macrobotrys' has reddish-violet blossoms that may be 3 feet long. `Texas Purple' has deep violet-purple flowers. `Geisha' has bluish to violet blooms. `Violacea plena' has double-flowered blue blossoms.